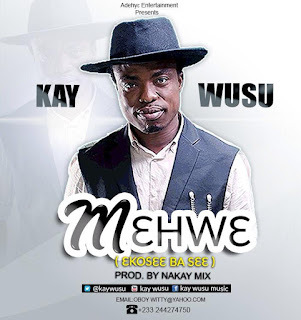 Staying off the music radar for over a decade is long time enough to discourage any Artiste from bouncing back but not Highlife Artiste, Kay Wusu who composed songs like "Oyerepa, Asore" among others before going into hiatus. After being in the "wilderness" for a long time, the "Afro-Centric" Highlife Musician as he describes himself says he is back with a new swag to spice up the Highlife terrain. That swag, according to him is summed up in his new single titled, MEHW3. The song, a Highlife tune with suggestive lyrics entreats men to speak more of sweet words to women. However, in an interview, Kay Wusu denied claims that his song "Asore" has risque lyrics. He said that, he was being creative and humorous and was happy with the outcome considering the feedback since the song hit the airwaves a couple of months ago. Formerly of Maddhaus Entertainment, Kay Wusu real name Anthony Kofi Owusu, a native of Nsuta in the Ashanti Region, he is hopeful, MEHW3 will give him the needed publicity and attention in the Music Industry. He further revealed that, he is ready for a massive work in 2019 adding that, he has other good songs which will be a prelude to his upcoming album scheduled for release later in the year.